In the book, named after a bitterly obscene song from World War II, three young men ­ one white, one Asian and one black ­ join the army because they see it as their only way out of poverty and failure. They are all under-educated, and they are all bright. They quickly realise that the promises they were made in the recruitment process are completely cynical. In the final analysis, they are cannon fodder. And the government’s appetite for foreign war adventures seems insatiable. They do not go to Deepcut ­ although they fear the word ­ but they find life at Catterick in Yorkshire is challenging in the extreme. If you fit, you are fine. If you don’t fit, then God help you. They see bullying, dishonesty, racism, crime. And at the end of it, the chance of being turned into a pink mist, or brought home in a body bag. Although the book has only just been released as a Kindle ebook, it has already attracted extraordinary praise. The author has priced it at less than a pound because he wants it to be available to people who don¹t normally buy books at all. 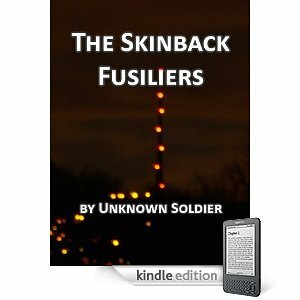 This entry was posted in Entertainment and tagged Joe Glenton, SKINBACK FUSILIERS, Unknown Soldier, openDemocracy. Bookmark the permalink.